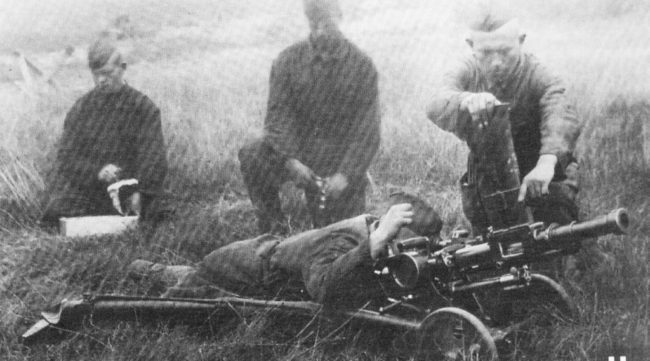 The Taubin automatic grenade launcher was a unique weapon well ahead of its time. It was designed around 1935-1937 by a team of Soviet engineers led by Y.Taubin and M.Baburin and offered to the Red (Soviet) army as an infantry support weapon. It was an apparent attempt to produce a select-fire equivalent of WW1 era 37mm short-range “trench” cannons. It was also offered as a secondary armament for riverine and naval crafts and as an air-to-ground weapon for attack planes (modified for belt feed). However, it did not succeed in any of these roles, being too complex, expensive and fragile. In the infantry support role it lost to the 50mm mortar which was more than three times lighter, a lot less expensive and much more reliable, while also firing a more powerful bomb. It did have a somewhat shorter range and slower rate of fire though. The theoretical advantages of the Taubin grenade launcher were direct and indirect fire capabilities and the ability to drop up to five explosive rounds on one target in a very short amount of time. The cyclic rate of fire being between 3 and 7 rounds per second, varying between prototypes. However, as stated above, the Red Army was not interested in this heavy and expensive weapon, which also had an unusually high number of stoppages and breakages, a trait typical to most guns designed by Taubin. In the end, the two chief designers of this gun were arrested in 1941 and later sentenced to death. Their ‘crimes’ being their failure to provide the Soviet Air Force with the automatic cannons and machine guns they promised and got advances for. Like the grenade launcher, Taubin aircraft guns proved to be extremely under-developed, fragile and unreliable. This put an end to the development of this weapon, and the concept of an AGL was resurrected in the USSR only during the late 1960’s, with the introduction of the noticeably simpler and much more reliable AGS-17. The Taubin automatic grenade launcher was a select-fire weapon operating on a long recoil system. The bolt was locked to the barrel using a single locking piece, attached to the bolt and engaging a cut in the barrel extension. On early versions, ammunition was fed from the right, using specially designed 5-round clips. This feed system, which was operated by a reciprocating bolt, proved to be too complicated and unreliable, and it was later replaced with conventional detachable box magazines inserted from the top. Each magazine also held 5 rounds. The gun was mounted on a wheeled mount, and had a specially designed optical sight. Ammunition for the Taubin AGL was produced as individual rounds, with an unusually stubby rimless case only 17mm long. It was loaded with explosive / fragmentation projectiles weighing around 0.59kg. Muzzle velocity was approximately 120 m/s and maximum range was 1250 meters.